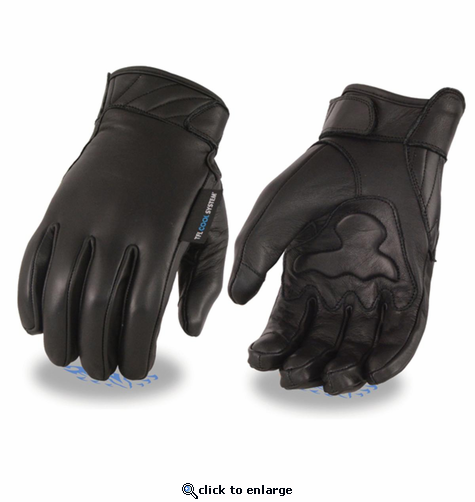 Milwaukee Leather Men's Leather Gloves with Gel Palm, Cool Tec Technology - Touch Screen Fingers. Welcome to Milwaukee Leather, a city known for the evolution of motorcycles and now a brand known for its cutting edge technology and world's finest leather in the industry. Since 1991 Milwaukee Leather has specialized in all classic riding apparel. As time changed so did we by staying above the industry standards. ***We've grown our offerings to include the most state of the art features for comfort and protection. Some of which include the incredible hand of our leather and the perfect fit of all our garments. We have riding gear for the cooler days and nights in our Heated Line of apparel and gear for the hot summer days to cool you, featuring COOL TEC Leather. Touch Screen Leather Gloves and Climate Controlled Biker Boots are other items that increase the pleasure of the ride. Our luggage is second to none; we have a piece no matter what your traveling needs. Milwaukee Leather guarantees all of our handpicked leathers for all of our apparel to allow us to continue to provide the market place with consistency and quality. This makes us who we are and what we stand for Milwaukee Leather not just another name but a brand you can count on.